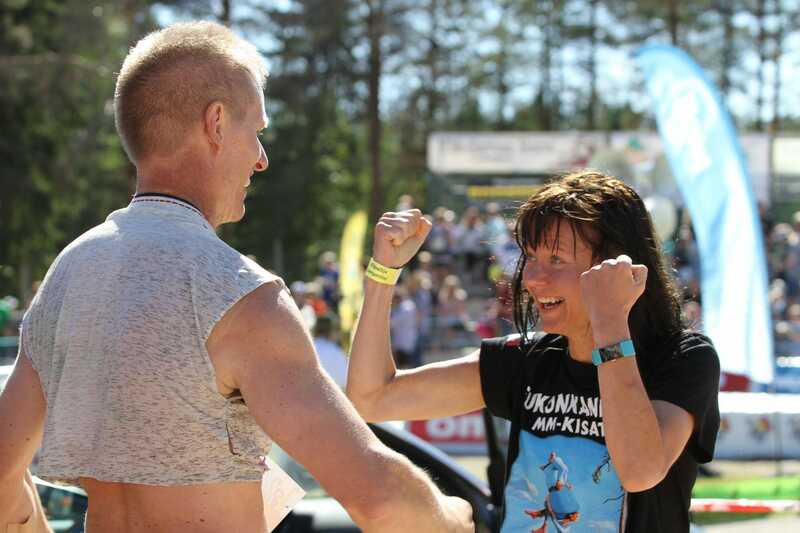 eukonkantoTaisto Miettinen and Kristiina Haapanen are the six-time champions of the World Wife Carrying Championships. Taisto Miettinen and Kristiina Haapanen aren’t married, but they do get extremely close. 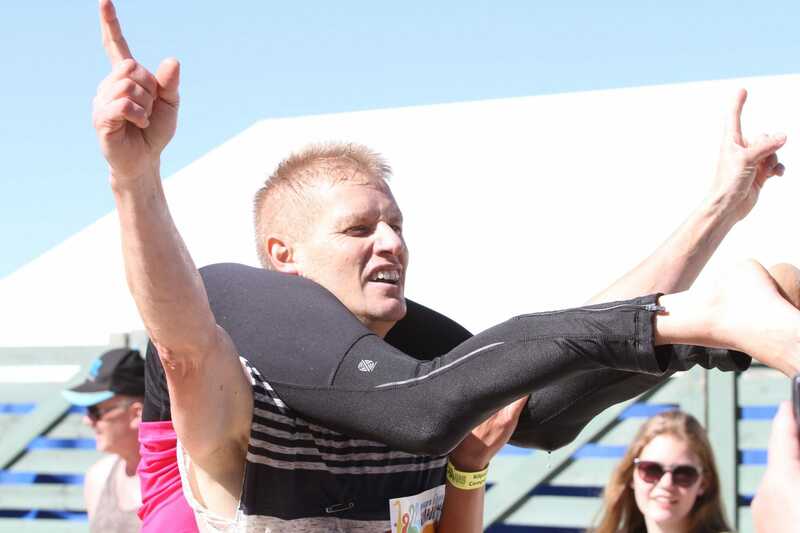 Miettinen and Haapanen, both natives of Finland, are the six-time and reigning champions of the World Wife Carrying Championships. The yearly competition involves men hauling a female partner — a “wife” — across a 250-meter obstacle course. The sport, called eukonkanto in Finnish, originated in the 19th century, when legend has it that a team of forest-dwelling robbers would sneak into homes in the dead of night, kidnap women, and carry them into the woods. The tale has since morphed into a more light-hearted sport. Official rules dictate the “wife” can be any woman 18 years or older who weighs at least 108 pounds. If she is too light, contest officials will outfit her with additional weight. Miettinen and Haapanen won this year’s contest on July 1, with a final time of 68 seconds. “The winning is the best part I think,” Haapanen, 33, told Business Insider. Sixty teams from a dozen countries were represented at the 2017 championships. Each heat involved three teams racing through two dry obstacles — typically sand or hurdles — and a wet obstacle at least one meter deep. Each was vying for the fastest time among the pool of 60 entrants. eukonkantoMiettinen carried Haapanen through the course in less than 70 seconds. Haapanen and Miettinen, both of whom are dating other people in their non-competitive lives, met in 2007. Miettinen had already been competing in wife-carrying for about a decade, but his current “wife” had a party to attend on the day of the competition. Miettinen needed an alternate, and since he didn’t have much time to search, he had to get clever. Haapanen says she’d heard of the sport and was eager to give it a try. Two years later, the “couple” won their first World Championship. They won again in 2010. And again. And again. In 2014, a rival pair of Finns stole the title from Miettinen and Haapanen. It wasn’t until this year’s competition that they finally stole it back, marking their sixth victory. Compared to past events, Miettinen said the 2017 performance was on the slower side. The pair’s fastest time is 60 seconds, but that was in the years before there was a weight minimum, he said. The team has yet to challenge the world record of 56 seconds. Still, Miettinen knows he owns the sport. Haapanen said the duo meets up roughly once a month in the winter and roughly twice a week from March until the finals to train. She has no plans of stopping, and says the only factor in her longevity in the sport is whether Miettinen’s legs can keep pumping. He’s told her that if they finish lower than the top three, he’ll move into the senior division and dominate there. If Miettinen ever bows out, Haapanen said she might have to recruit other “husbands” to carry her to victory. “Maybe I could train my own man,” she said.